October is Attention-Deficit/Hyperactivity Disorder (ADHD) awareness month. Did you know that many children with severe symptoms of ADHD are diagnosed before 6 years of age? Young children with ADHD need the right treatment for ADHD. 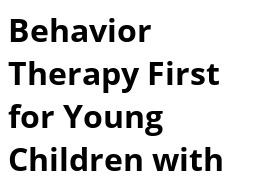 Learn about using parent behavior therapy first to help young children with ADHD.